My guys are all 49, and about 10 mins from 50. I stopped running quests in Felwood just before I rolled over, and went back to the battlegrounds. I had another great night of pvp, and decided I liked AB better. I won my first match (WOOT!) then lost the second because I had 4 (FOUR!!) Oooglers following me around on their mounts taking screenshots. It was painful. But I'm starting to feel like there's not alot more to gain from pvping in the 40s. I got each of my boys their Battle Healer's Cloak from Warsong, and they're about half way to their Insignia of the Horde pvp trinkets. But there's something special dragging me closer to 50. The Totem of Wrath. Summons a Totem of Wrath with 5 health at the feet of the caster. The totem increases the chance to hit and critically strike with spells by 3% for all party members within 20 yards. Lasts 2 min. If you're read my Stackable Totems Guide, you already know why this little totem is so desireable. IT STACKS. That's right... the 3% Crit and 3% Hit is applied to each member of my party, PER ToW I drop. Therefore, when I drop all 5, each Shaman will gain 15% Crit and 15% Hit. Just typing that makes me want to quit my job, get home and level to 50 asap. Lets talk about just how good that is. First, lets focus on the +Hit. 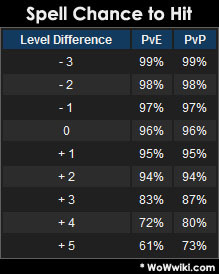 If you take a look at this Spell Hit Chart I grabbed from WoWwiki, you'll notice we have an inherent chance to miss of 4% when fighting either players or mobs our own level. Seeing as I quest and raid against mobs up to 3 levels above me, my chance to hit them with my spells is dropped to 83%. So by dropping 5 Totems of Wrath, I've instantly moved them to a 98% chance to hit. Bam. That equals DPS kids, pure and simple. Then there's the crit. My guys are all hovering around 6% chance to crit with "decent" blue gear for their level. The ToW will put them all at 21% instantly. After doing a bunch of really ugly math I'm sure you don't want to see, I came up with these numbers. 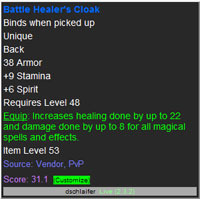 The increased hit and crit, will add 21% damage to my group. That's like adding a 6th Shaman. That's nuts. Just from one little talent point. And that's not all. damage spell, you enter a Clearcasting state. The Clearcasting state reduces the mana cost of your next 2 damage spells by 40%. So with crit going from 6% to 21%, I'll have Clearcasting up more often, reducing the cost of my spells. After some more ugly math, I figured out that I'll essentially gain nearly 20% more mana on my Shaman. So you see why it's so tempting to roll over to 50? 21% damage and 20% mana. I'll be storming Mauradon in no time. Up to this point I haven't been able to get past the first boss without Boom. But this would mean no more PvP for a while. Then again, AV becomes available at 51... oh man I am SO going to level when I get home. Think I'm making a good choice?